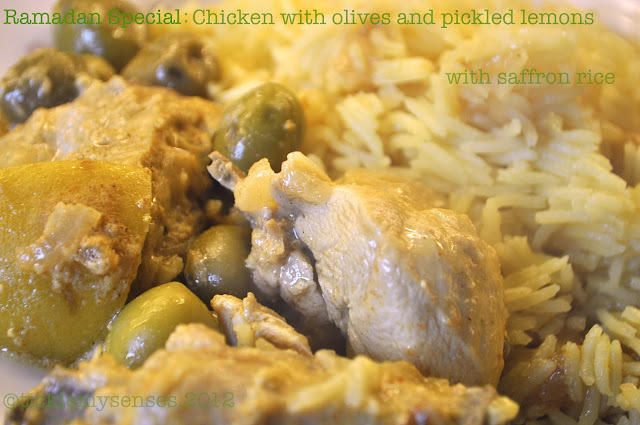 Tickle My Senses: Chicken with Olives and Pickled Lemons: Middle Eastern Special for Ramadan. Chicken with Olives and Pickled Lemons: Middle Eastern Special for Ramadan. One of the things I love most about Middle Eastern cooking is the use of healthy, fresh, wholesome ingredients and an exotic combinations of spices. Chicken with Preserved Lemons and Olives is a very popular dish in the Middle East and more so in Morocco. This recipe uses an exotic, complex, aromatic Moroccan spice blend spice known as Ras El Hanout. Typically prepared by grinding together whole spices like cardamom, nutmeg, anise, mace, cinnamon, ginger, various peppers, and turmeric, dried roots and leaves. Certain spice blends use 30 or more ingredients. Most mediterrenean and middle eastern stores stock Ras El Hanout. While some Moroccans use it in daily cooking, others reserve it for specialty dishes. The combination of olives, pickled lemons, and the Ras El Hanout spice gives birth to a unique chicken stew that is bursting with an unusual blend of flavors. Why not enjoy the tangy and aromatic flavours of this Chicken dish with a serving of couscous or saffron rice. 1. Season chicken with salt and pepper. Heat oil in heavy bottomed pot and add chicken fry till lighlty browned. Remove the chicken keep aside. 2. To the same pan add the onions. Cook the onions over low heat until they start to soften. Add the garlic, bay leaf and spices, stir well to coat the onions with the spices. 3. Add the chicken stock to the pot and stir well. Add the chicken back to the pot. Bring to a boil and then reduce to a slow, steady simmer and cover. Cook for about 45 minutes and then add the olives and the pickled lemons. Continue cooking another 20-30 minutes, uncovered, or until the chicken is falling off the bone. 4. Remove the chicken from the pot and continue cooking the liquid until it reduces to a saucy consistency. Add the lemon juice, cilantro, and parsley to the sauce. Serve the chicken with saffron rice or cous cous. Spoon the sauce on top. Goan Chicken Xacuti without Coconut. Tomato and Herb Scrambled Eggs.